October 29, 2018 – DJI, the world’s leader in civilian drones and aerial imaging technology, today unveiled the Mavic 2 Enterprise, a portable drone with uniquely powerful features designed for businesses, governments, educators and other professionals who want a reliable everyday tool that helps them do their work better. 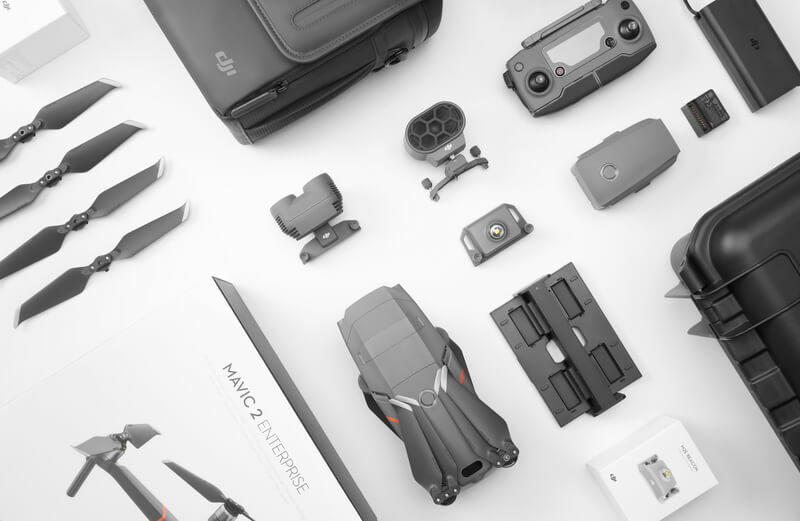 Engineered for businesses that seek to transform their operations with drone technology, the Mavic 2 Enterprise features an ultra-compact and foldable design with an array of advanced controls and accessories that extend users’ capabilities during critical operations like firefighting, emergency response, law enforcement, and infrastructure inspections. Mavic 2 Enterprise carries a high-resolution, 12-megapixel camera that is stabilized by a three-axis gimbal for smooth, stable video and images. Designed for dynamic operations, the camera extends the pilot’s sense of sight with a 2x optical and 3x digital zoom capability. This zoom technology profoundly improves the ability of drones to identify and inspect dangerous or difficult areas, as well as to help emergency services protect life and property. Mavic 2 Enterprise allows new DJI accessories to be securely mounted to the drone’s body and is operated through the flight control app. These accessories open new paths for pilots to communicate and work from the air, moving drones beyond imaging tools and into configurable platforms that enhance aerial productivity. M2E Spotlight – A dual spotlight with a brightness of 2,400 lumens aids operators in carrying out missions in dark or low-light areas. Spotlight is ideal for search and rescue as well as inspection applications. M2E Speaker – A loudspeaker with a maximum projection of 100 decibels (1-meter distance) lets pilots play up to 10 custom voice recordings on demand, providing a communications channel to nearby individuals that can be critical during lifesaving emergency operations. M2E Beacon – Designed with U.S. Federal Aviation Administration (FAA) Night Waiver standards in mind, the M2E Beacon features a bright flashing strobe visible three miles away. This helps pilots carry out missions in low-light conditions or at night much more safely, and provides additional airspace awareness for operators of nearby drones and traditional aircraft. Mavic 2 Enterprise is designed with new features to protect the integrity of photos, videos, flight logs and other data generated during sensitive flights. An industry first, Mavic 2 Enterprise incorporates 24 GB of onboard data storage and password protection, creating accountability for all access to the drone’s functions and stored data. When Password Protection is enabled, users are required to enter their password each time they activate the drone, link the remote controller with the drone, and access the drone’s onboard storage, giving them full, exclusive use and enhanced security. This provides secure access to the drone and its onboard data storage, while protecting that data even if the drone is physically compromised. In addition, Mavic 2 Enterprise users with heightened data security concerns can use DJI’s Local Data Mode feature which, when activated, will stop the user’s connected mobile device from sending or receiving any data over the internet. This provides added security assurances for operators of flights involving critical infrastructure, governmental projects or other sensitive missions. Every Mavic 2 Enterprise comes equipped with DJI’s AirSense technology to help improve pilots’ situational awareness and enhance airspace safety. AirSense uses an integrated receiver to automatically alert drone pilots of ADS-B signals from nearby airplanes and helicopters, providing real-time positioning alerts through the DJI Pilot mobile app. This provides an extra level of safety for professional drone operators who fly in congested airspace or near complicated operations, such as wildfire suppression, disaster recovery and infrastructure monitoring. DJI AirSense is a key system to help ensure drones remain a safe addition to the skies. Mavic 2 Enterprise uses DJI’s FOC propulsion motors combined with efficient propellers for quieter and more efficient flight, delivering a maximum flight time of up to 31 minutes and a top speed of 72 kph (45 mph). In addition, a new self-heating battery developed specifically for Mavic 2 Enterprise allows the drone to perform reliably in adverse weather conditions as low as -10 Celsius (14 Fahrenheit). Mavic 2 Enterprise features DJI’s latest video and data transmission system, Ocusync 2.0, providing a more stable connection between the drone and its remote controller. The system features stronger interference resistance and auto-switching capabilities that support both 2.4 GHz and 5.8 GHz frequency bands with the capability to use different frequencies for uplink and downlink data streams. Ocusync 2.0 delivers such a strong high definition video transmission feed back to the pilot that it could be received up to nearly five miles (eight km) away, though all drone pilots must follow applicable laws about keeping drones within their line of sight. Mavic 2 Enterprise’s FlightAutonomy system features omnidirectional obstacle sensing for safer flight, incorporating data from eight high-resolution vision sensors and two infrared sensors. Its Advanced Pilot Assistance System (APAS) allows the drone to sense and automatically avoid obstacles in front of and behind it, providing additional safety – especially for new pilots and when flying in areas with obstacles or rugged terrain. The Mavic 2 Enterprise will be showcased in public for the first time tomorrow at DJI’s AirWorks Conference, an annual commercial drone event that brings the ecosystem together to inspire, connect and energize attendees about the beneficial drone applications available to enterprises today. The conference begins tomorrow in Dallas, Texas, and will conclude on November 1. For more information, please visit enterprise.dji.com/airworks.